Pizzofalcone is a bright and panoramic apartment located on Via Monte di Dio. Pizzofalcone is a bright and panoramic apartment located on Via Monte di Dio. It's on the third floor with elevator, in a noble building with an inner courtyard. The area is very quiet and perfect for anyone who wants to spend a relaxing holiday or to live in the beating heart of the city. The apartment is located in a strategic position: only 3 minutes walk to one of the ’symbols‘ of the city, Piazza del Plebiscito, with his imposing Palace and San Carlo Theatre. In only 5 minutes walk you can reach the esplanade, and there enjoy the enchanting gulf with his islands, the Sorrentine peninsula, and Mt Vesuvius in all his splendor. 15 minutes walk, crossing the lively Toledo street, it's possible to reach the historical centre and all the main places of historical-cultural interest. The apartment is a 65 mq open-space with separate kitchen and bathroom. Well finished in all details, it has an extremely scenographic and central bed area with fireplace and a stunning sea views from the terrace. The space, very versatile, can host up to 4 people, with its 2 sofa-beds. 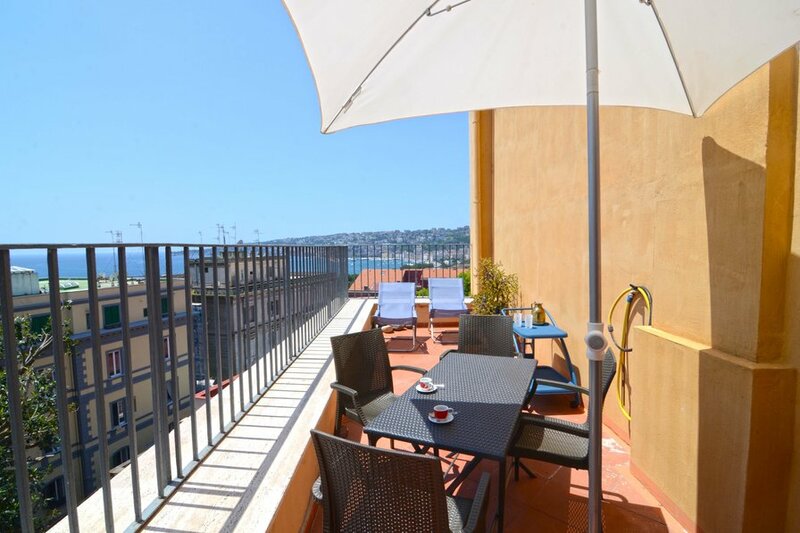 The terrace offers a wonderful view on the gulf and the enchanting hill district Posillipo. Furthermore, it is equipped with everything you’ll need to enjoy the breath-taking view ( deck chairs, beach umbrella, table with chairs, and a small side table). It comes with wi-fi, hair-dryer, linen, washing machine, air-conditioning, fully-equipped kitchen, separate terrace.